Researchers from the University of Maryland’s College of Agriculture and Natural Resources (AGNR) will soon test a cutting-edge approach for eradicating the most ancient disease known to mankind – influenza – thanks to a $1.6 million grant awarded by the USDA’s National Institute of Food and Agriculture (NIFA). 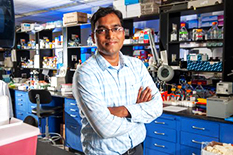 Led by Bhanu Telugu, PhD, Assistant Professor in the Department of Animal and Avian Sciences, the research team will use advanced genome editing technologies to engineer flu resistance in pigs and prevent the flu from spreading to other pigs and to humans, who can contract the virus from swine. Scientists will do this by deleting receptors in the pigs’ genetic codes to block the virus’ entry and inserting what are called “decoy” genes to prevent the disease from replicating. An influenza outbreak in commercial swine herds, such as the pandemic of 2009, can quickly spread across the globe and economically devastate the pork industry. Meanwhile, seasonal influenza in humans leads to an estimated $11 billion in direct and indirect costs every year in the United States alone, according to the Centers for Disease Control (CDC). Although recorded evidence of the flu dates all the way back to Greek philosopher Hippocrates, who died in 370 B.C., scientists have yet to defeat the disease, only to vaccinate against it. Telugu is hopeful he and his team can use the domestic pig as a model for fighting the flu in humans and other species. “Our argument is if we are to eliminate this disease, we have to go after the source – in this case, the pig,” says Telugu. The five-year study will be conducted at the Animal Bioscience and Biotechnology Laboratory, a building jointly owned by the University of Maryland and the USDA and one of only a handful around the world equipped with the biomedical tools necessary for this type of research. The UMD team was one of just six awarded a NIFA grant from a pool of approximately 170 applicants.